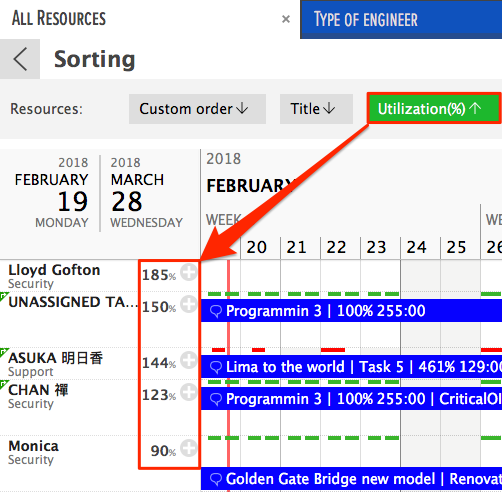 Automatic resource sorting is available both in Gantt chart view and in the resource list. In Gantt chart view, you'll be able to sort resources in alphabetical or custom order as well as based on their utilization percentage. If you have resources grouped by projects, you can also sort projects by start/end date or any other 'Date' type data field. You can also create the order of the resource list manually. You can sort resources in different views as well as in the resource list. Custom order is the default setting for resource sorting. This will open the sorting options. You can sort resources alphabetically by title or by utilization percentage. Custom order is applied by default. It's the order of adding them or the manual order that can be set in the resources list. Sorting resources by the utilization percentage is a good way to find the resources that are free during the time period that you have open in the Gantt chart area. If you pair resource sorting with filtering, you can filter out the resources with the right skills for the task you are planning and then choose the one with the lowest utilization percentage to assign the task to. You'll find the resource list icon on the sidebar. 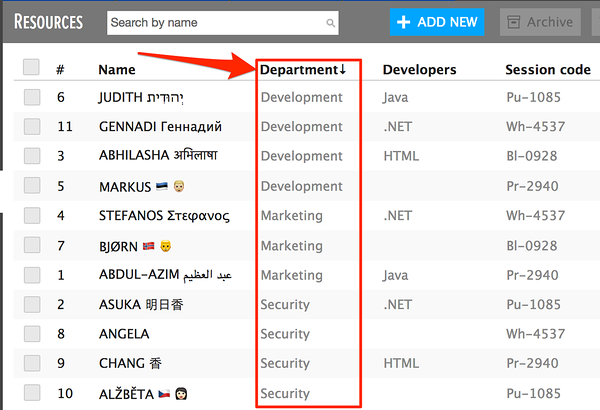 You can sort resources by queue number, name, or any of the custom data fields. To cancel the option, click on it again. Did not find the answer to your question regarding automatic resource sorting?